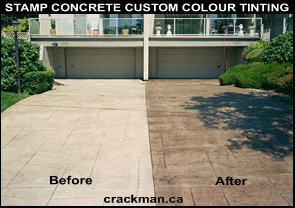 Concrete colour tinting and concrete repair - Call the Crackman for mobile concrete crack repairs and concrete driveway refinishing. patterns such as Ashler, Cobblestone and Rockprint. 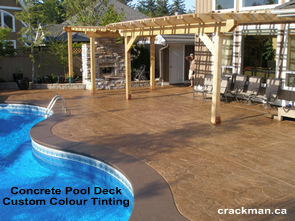 coatings, and custom colour tints your concrete. Homeowners and Commercial Property Owners. Contact Us today or use our "Request a Quote" form. Have a tired looking stamped concrete pool deck? The Crackman will have it looking like new in no time! Our concrete restorations exceed our Customer's expectations for quality and at an affordable price. Our best recommendations come from the best source, our valued customers. Click here to see what our Customers are saying. We offer Free Estimates and top-quality work at a reasonable price. The Crackman makes the concrete crack repair seem almost invisible.